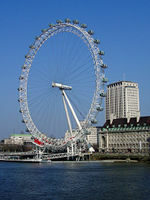 The London Eye, inaugurated on Millennium eve, is the tallest Ferris wheel in Europe. Found on the south bank of the Thomas in the heart of Central London, the Eye stands 135 metres high, with a diameter of 120 metres, and cost £70 million to construct. The Eye is a cantilevered observation wheel, supported on one side by an A-frame and tensioned steel cables. The wheel’s 32 capsules are air-conditioned and each hold up to 25 passengers. Rotating at a speed of just under 1 kilometre an hour, a complete revolution takes about half an hour. Around 3 million take a spin on the Eye each year, with about 40 million passengers having been carried since 2000. You can see 55 of London’s landmarks from the top, including Big Ben, Westminster Abbey, St Paul’s Cathedral, the Tower of London, the Gherkin, the Savoy and Buckingham Palace. where? London Eye, Riverside Building, County Hall, Westminster Bridge Road, Central London SE1 7PB. Tubes: Waterloo, Embankment, Westminster. when? 10am to between 8.30pm and 10pm, depending on the time of year. £$€¥ £26.25 per passenger (same price for adults and children). More if you don't book online. St Paul’s Cathedralwas designed by Sir Christopher Wren and built between 1675 and 1710 after its predecessor was destroyed by the great fire of London. Since then, it has hosted some of the most important religious services in country’s history including the funerals of Nelson, the Duke of Wellington and Winston Churchill, and the marriage of Prince Charles to Lady Diana Spencer. Of interest to visitors will be St Paul’s famous 108 metre-high dome, the two imposing towers at its west end (one housing a 16.5 tonne bell), its crypt and the 530 steps leading to its whispering and then golden galleries. where? St Paul's Cathedral , St Paul's Churchyard, Central London, EC4M 8AD. Tubes: St Paul’s and Mansion House. when? Open to sightseers between 8.30 am and 4 pm Mon to Sat. But check website before visit. £$€¥ Adults: £11, Seniors: £10, Students: £8.50, Children: £3.50. The Houses of Parliament and nearby Westminster Abbey are London’s second world heritage site. The public can visit Parliament all year round, with visitors able to access the majestic Westminster Hall, built in 1097 (the place where Charles I was sentenced to death in 1649), the public galleries (to view debates), and the busy central lobby situated between the two Chambers (with huge chandelier and statues of monarchs and prime ministers). Westminster Abbey, a stone’s throw from Parliament, should be next on your list. The Abbey has hosted the nation’s most important religious events since 960 AD, including the coronations of William the Conqueror in 1066 and Queen Elizabeth II in 1953. Don’t miss Poets’ Corner, where Chaucer, Dickens, Shakespeare, Tennyson and Wordsworth are either buried or memorialised. where? Houses of Parliament and Westminster Abbey, Westminster, Central London. Tube: Westminster. when? Parliament: check website before visiting. Westminster Abbey: Mon to Sat only (unless you go to worship), usually from 9.30 am to 4.30 pm. £$€¥ The Houses of Parliament are free to enter. Westminster Abbey: Adults: £15, Concessions: £12, Children: £6. Central London's two principal Royal Parks—St James' Park and Hyde Park —occupy around 800 acres, making London one of the world's greenest capitals. They are complemented by North London's Regent's Park and East London's Victoria Park. Hyde Park, when taken together with the adjacent Kensington Gardens, is the largest all of London's parks. Highlights include visiting the Park’s memorials (including the recently added Diana Fountain, designed to express Diana's spirit, represented by fast-flowing water, and made from 545 pieces of Cornish granite), its formal gardens (in particular the rose gardens), the Serpentine lake (where you can take a dip in summer or hire a pedalo), Speaker’s corner (where you might catch some spirited political or religious debate), and the Serpentine Art gallery. St James' Park is much smaller, enclosed on three sides by Horseguard's Parade, The Mall and Buckingham Palace. Visitors should try to catch the feeding of its four pelicans, each day between 2.30-3.30pm, and the changing of the guard outside Buckingham Palace at 11.30 every day between May and July and on alternate days for the rest of the year. where? For Hyde Park, the closest tube stations are Marble Arch and Hyde Park Corner; for St James' Park, use Westminster or St James Park. when? Hyde Park and St James' are open from 5am to midnight, 365 days a year. Those looking for an alternative activity should consider a walking tour of legal London. Start at the Old Bailey, also known as the Central Criminal Court, which hears the country's most serious criminal cases. The principle of open justice means that those who are prepared to go through strict security can watch part of a criminal trial—perhaps a murder or a robbery—complete with bewigged barristers and judge, 12-man jury and old-fashioned, book-lined courtroom. Then head west down Fleet Street and take a left down Bouverie Street until you see the main gates of the Inner Temple. One of the four Inns of Court, the societies which are still responsible for conferring rights of audience on barristers, Inner Temple is made up of barristers' chambers, Inner Temple Hall (where barristers and Judges eat) and, most famously, Temple Church. This round church, built in the 12th century as the headquarters of the Knights Templar, is famous for its effigy tombs and for featuring in Dan Brown's Da Vinci Code. Once you are finished, head north to Fleet Street and continue west until you reach the imposing Royal Courts of Justice. This gothic building, which houses the High Court of Justice and the Court of Appeal, was built in the 1870s and opened by Queen Victoria in 1882. Tourists are again able to watch most hearings. Leave the Royal Courts through the Cary Street exit and head north into Lincoln's Inn. Visitors are free to access the Inn during the week and should take in its excellent gardens and its other historic buildings. Chief amongst them is the Inn's Chapel, built between 1620 and 1623 after the foundation stone was laid by John Dunne. The Chapel, aspects of which were designed by Christopher Wren, has two isles and fantastic stained glass. when? The Inns of Court are open between 8am and 7pm Monday to Friday. Courts sit between 10.30am and 4.30pm Monday to Friday.